C++, Python, Rust, Emacs, Clang, CMake, and other technobabble..
Having used Emacs since 2006, I never found a good, reliable, and general enough solution to code completion, symbol cross referencing, go-to definition until I stumbled upon the Language Server Protocol (LSP). The Language Server protocol is used between a tool (the client) and a language smartness provider (the server) to integrate features like auto complete, go to definition, find all references and alike into the tool. LSP reduces an \(m \times n\) complexity problem to \(m + n\): the latter refers to only needing a language server for each language and a client for each IDE, whereas the former means that for every language each IDE would require, in most cases, standalone support. 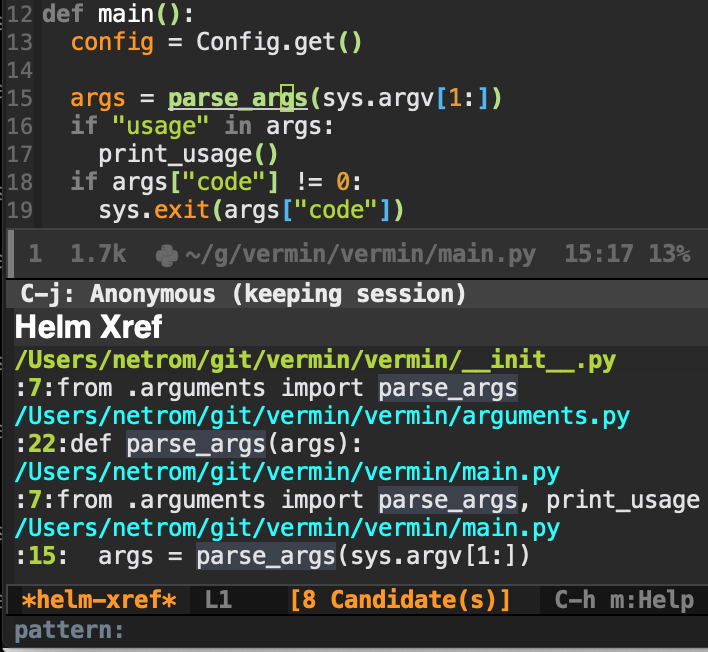 In this article, I will go over the configuration and setup of Emacs for LSP support of C++, Python, and Rust. It is assumed that Emacs version 25.1 or later is already installed and setup for basic usage, and that you’re familiar with editing its config file. Additionally, I use macOS but the installation commands can easily be translated to other solutions and other OSs. lsp-mode comes prepackaged to use certain available LSP servers, that it will automatically spin up when a mode requests it (by invoking lsp). If LSP servers were already installed at this point, then you would be all set. Clangd is currently the best working language server for C++ for the projects I work on. Even though cquery comes as a default in lsp-mode, and has more features than clangd, there were times that it would fail to find known symbols for large projects, and both the index generation time and size were longer and bigger than clangd’s. Edit 2019-04-02: Using --HEAD instead of --head. ;; `-background-index' requires clangd v8+! It tells clangd that it can use 4 concurrent jobs and to make a complete background index on disk. Without -background-index, it will only keep an in-memory index of the files that are active in Emacs buffers, but to be able to find references and symbols in any project file the background index is recommended. It is placed at the project root as the “.clangd” folder. Skip the rustup installation if Rust is already installed. Using LSP is easy: open a source code file with one of the major modes associated the lsp hook. If no running language server is handling the particular project, a new one will be spun up to communicate with lsp-mode. Do not ask more for the current project (select ignore path interactively). Do nothing and ask me again when opening other files from the folder. Import project by selecting root directory interactively. Usually the last option is what you want. Simply write Import ↹ root ↹ ↵. LSP :: Connected to [pyls:94242 status:starting]. def main():  # Cursor will be at 'm'. LSP :: Connected to [pyls:94242]. The results are displayed this way due to the helm and helm-xref packages. Take a look here for more information about extensions and features. Edit 2019-04-01: My .emacs.d is freely available for the complete LSP configuration, and lots of other stuff related to Emacs. This section is dedicated to extra features and niceties that I find makes LSP more usable and powerful. lsp-ui adds higher level UI modules, like documentation child frame while hovering a symbol, integration with flycheck, and enables inline definition and references peeking - just to name a few things. (setq lsp-prefer-flymake nil) ;; Prefer using lsp-ui (flycheck) over flymake. The Hydra is vanquished once Hercules, any binding that isn’t the Hydra’s head, arrives. Note that Hercules, besides vanquishing the Hydra, will still serve his original purpose, calling his proper command. This makes the Hydra very seamless, it’s like a minor mode that disables itself auto-magically. In essence, it yields a menu with keybindings in the minibuffer, a hydra, which won’t be shown if the bindings are pressed fast enough. Edit 2019-04-01: Using helm-imenu instead of lsp-ui-imenu because the former enables easy filtering via Helm. ;; Disable client-side cache because the LSP server does a better job.